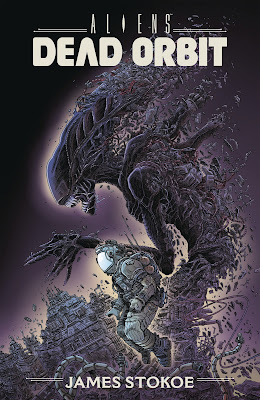 Aliens: Dead Orbit by James Stokoe, published by Dark Horse. 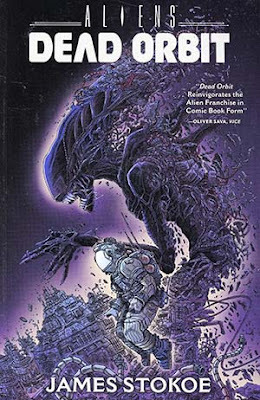 Stokoe's Alien story heavily homages the 1979 Ridley Scott film, creating a haunted-house-in-space story where the xenomorph is a force of nature. Stokoe's maddening artwork captures the claustrophobic dread of the original film, reminding us of why we fell in love with this creature in the first place. 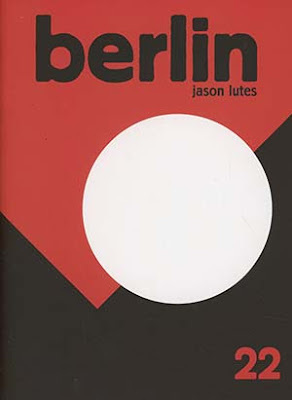 Berlin #22 by Jason Lutes, published by Drawn & Quarterly. 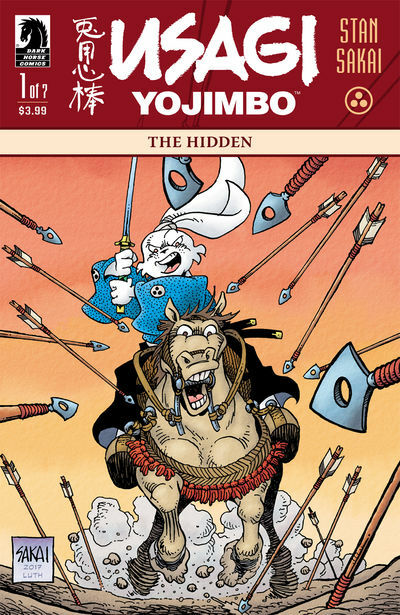 It's been over 20 years since Lutes started this series and the end is finally here. I hate to say it but after years between issues, I fell off of the Berlin wagon sometime in the last 5 years. So I'm going to have to wait until either the collection of the third book or the complete Berlin book that D&Q already has scheduled for later this year to catch up on this one. 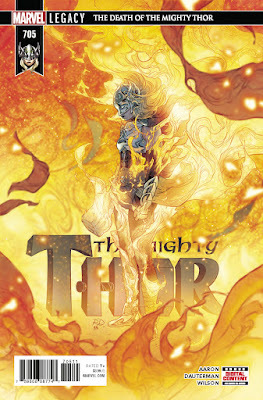 The Mighty Thor #705 by Jason Aaron and Russell Dauterman, published by Marvel Comics. 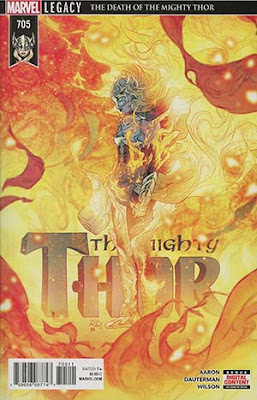 Speaking of endings, here's the penultimate issue of The Mighty Thor, Jason Aaron and Russell Dauterman's epic story of Jane Foster. While Aaron will be writing more He-Thor after this, the story of Jane Foster has been one of the best Thor stories of all time and has easily been the highlight of Marvel's recent output. Part of me hopes that this story ends with Jane Foster relinquishing the power of Thor but becoming the new Thunderstrike but I kind of doubt that. Dept. 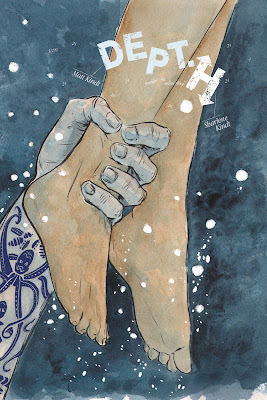 H #24 by Matt and Sharlene Kindt, published by Dark Horse. This is the final issue of Dept. H and I'm really going to miss this series. It ended up being very different from Mind MGMT (one of my all-time favorite comics) but really wonderful and thoughtful and sadin its own way, in addition to being a tense mystery. 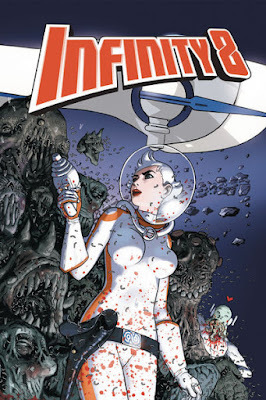 The Kindt's art has never been better; this is a gorgeous book that captures the weirdness and claustrophobia that I associate with the bottom of the ocean. I don't care at all about the Aliens movies. I do however absolutely love the art of James Stokoe, who draws these insanely intricate, detailed, stunning images. Really, go look up his work. Godzilla: The Half-Century War is an astonishing piece of work - there, another example of him creating something I love relating to a subject I'm not really interested in. Here, Stokoe really captures the fear and claustrophobia aboard a small spaceship, and perfectly captures the ramshackle industrial look of the ships. Jason Aaron and Russell Dauterman are almost done with their story of Jane Foster Thor, and it's really ended up being one of my favorite comics of recent years, and certainly one of the best Thor stories I've ever read. Aaron really gets these charaters, and Dauterman (with colors from Matt Wilson) is a staggeringly good artist who brings so much to vivid and emotional life. Read this whole run, it's big and epic and funny and emotional. 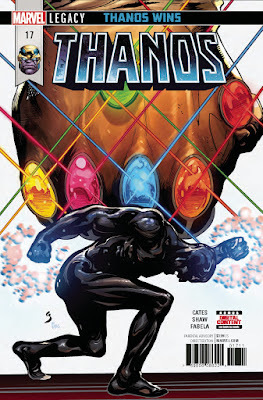 Thanos #17 by Donny Cates and Geoff Shaw, published by Marvel Comics. Thanos has really been terrific since Cates and Shaw took over. They made real magic on God Country (one of my favorite books of 2017) and they've really brought a lot to this book. It's darkly funny and dramatic and just a little weird. A great, violent, compelling read. 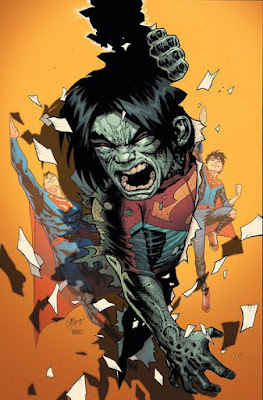 I said I would consider the closing issues of the stellar Tomasi/Gleason Superman run all must reads, and I vow to keep that pledge. I’ll forever sing the praises of these two and their frequent co-collaborators. Number 42, the first issue of the Boyzarro arc, sets up a thoughtful bookend for the series, and it gives glimpses of a storyline that functions both as a linear narrative (or as linear as anything Bizarro could be) and a metaphor for the creative process and its inevitable rebirth – NAY! – RE-DEATH! In more news about the end of all things good, Jason Lutes magnum opus, Berlin, concludes this week with issue 22. In the Panel Patter world, we occupy this unique bubble of comics culture, one that joyfully embraces both the self-indulgent world of mainstream superhero comics and the haughtily cerebral land of comix and cartoonists. Superhero fans, you should read Berlin. You should gather it any way you can and embrace a master class in sequential storytelling, regardless of genre. Color me intrigued – self contained three issue arcs, French creators as yet unheralded on our shores, wacky European sci-fi tropes – this looks like it will be a blast. It’s also a tie-in for Infinity Countdown! Oh. It’s not? Are you sure? Really. Hmm. I mean, almost everything else is, and this even has “infinity” in the title and . . . Ok. Fine. Still, buy it. It will be a cold day in hell before I bow to the gods of renumbering and desecrate the masterpiece with a new mini-series numbering schema. Nonetheless, we were treated to two fun story arcs at the end of 2017 with “The Body in the Library” and “The Mouse Trap.” The silver lining to the renumbering heartbreaker is that Sakai seems invested and eager, and his recent work certainly shows it. 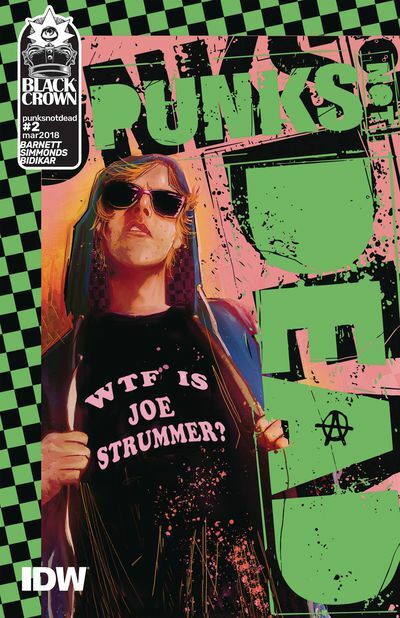 This strange little series that's part of the Black Crown line continues as we see just what having a dead punk in your life can do for you. Spoiler: Probably not anything good in the long run. This is just the kind of out there title you'd expect from Shelly Bond's editorial guidance, and it doesn't disappoint. From one of the brains of Lumberjanes comes a story about a barista who's also a werewolf, her girlfriend, and their friend Chet, who is in danger via an evil magician. They have to save the day, but will they be able to? 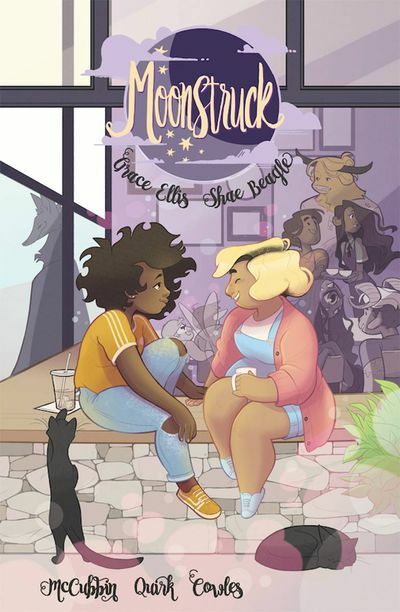 It's a very cute comic, done with the same positive friends vibe as Lumberjanes, and I think a lot of people who follow us here will dig it. Shae Beagle's art works very well for the story, and I look forward to seeing more work from them.